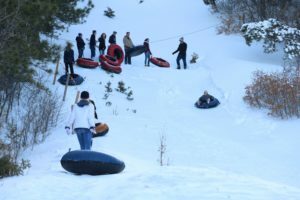 Check out our wide range of recreational activities for your camp or retreat groups to utilize as well as some activities that you may want to book for a day use group. It is our intention to provide quality, professional activities that can add to your experience here at Ponderosa and we look forward to hosting your group. 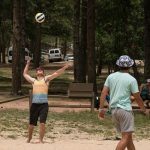 Please use the links below to explore what recreational activities Ponderosa has to offer. Looking for adventure-based activities for your group? We’ve got them! From a teambuilding experience on our Low Ropes Course to the personal challenge of the High Ropes Course, Climbing Tower, Leap of Faith, Vertical Playpen, and of course, the Zip Lines, we can provide the adventures. Our professional staff is trained to provide safe activities for all ages and backgrounds. 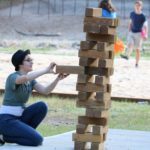 Whether you are coming to Ponderosa for a retreat or are interested in a day trip to utilize the Challenge Course activities, we would love to set up an appointment for your group. We routinely host faith-based, church, ministry, and missions groups from children to adults, as well as elementary to college- aged school groups and school staffs, as well as professional adult groups just to name a few. Our courses are all certified to meet current ACCT challenge course standards, and safety is our primary focus. Click on each link below to find out more about each activity we offer as well as pricing information. Don’t see a combination that works for your group? Call Andrew for questions or custom program options. All of our Challenge Course activities are available by reservation only and should be booked at least 30 days in advance. 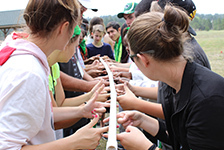 Our Low Ropes Teambuilding course is a powerful tool that utilizes a specialized series of challenges, low to the ground, combined with structured debrief discussions to help any team grow together as a unit. In as little as 2 hours, your team can be transformed into a more highly functioning group thanks to our experiential learning process. Our isolated, wooded setting helps the participants focus on each other as they progress through the increasingly difficult challenges. Building on lessons learned from each previous challenge, your team will develop to a whole new level. 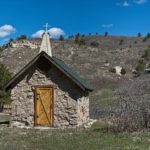 Our programs specialize in teaching spiritual life applications for our Christian groups but we also have secular lessons for our school and business clients. 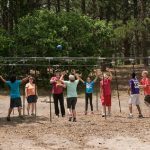 Some of our typical groups that benefit from the low ropes course are church youth groups and college groups, church staff, mission trip teams, school groups, school faculty, leadership teams, sports teams, corporate groups, and business teams. Groups of 12 to 15 participants are ideal in size, but if you have a larger group, we can split them up into multiple simultaneous groups as needed. Price for the Low Ropes Course is $20 per person- for 2 hours with a minimum of 10 people. *Release Forms are required and will be collected for each participant before your scheduled appointment. Click to download the Release Form. 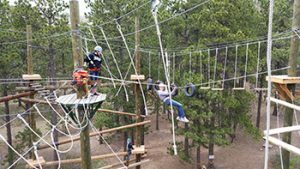 Call now to schedule your Low Ropes Course reservation at 719-481-2482 ext #14. We recommend booking all REC activities at least 30 days in advance to ensure availability and assist with scheduling of staff. Our High Ropes Course is the newest attraction at Ponderosa and by far the most popular. Featuring 11 traversing elements suspended at 40 feet in the air, the new course ties in to the top of the existing climbing tower to allow access to the Zip Lines as the primary exit to the course. Each of the 11 elements are organized into difficulty levels based on the snow skiing color system. 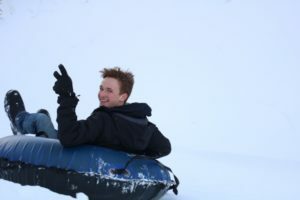 With our green, blue, and black diamond rated elements, participants can choose the elements they will attempt depending on their own personal comfort level. To access the course, each participant must first conquer a series of incline logs that zig zag their way up to the 40 foot mark. Once you have cleared this first daunting obstacle, then you are free to move about the course, choosing the path you will take. Once you make your way to the top of the tower, our staff will set you up to ride down on the zip lines. This course is the ultimate challenge with something to offer all comfort levels. Push yourself and overcome your fears in a safe environment as our course meets the highest level of safety standards. Our staff are fully trained in all safety procedures, and an ACCT certified belay system keeps you safe during the entire experience. Logistics of the course: This course requires a minimum reaching height and we have found that it is best suited physically and emotionally to students from 7th grade to adults. If your group is younger than 7th grade, then you can check out our Kid’s High Ropes Course or the Climbing Tower and Zip Lines. As you plan for your group’s reservation, you can estimate the time needed to be an average of 15-20 participants per hour. If your group has mixed ages and not everyone is in 7th grade or older, then please see our Climbing Tower and Zip Lines option since it can accommodate a wider age range. A five minute safety briefing will be given at the start of your scheduled course time, so it is very important to have your whole group present and on time for your reservation. The course is available by reservation only on a first come, first served basis. Multiple staff must be scheduled to operate this course so reservations should be made at least 30 days in advance. 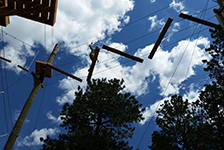 Call now to schedule your High Ropes Course reservation at 719-481-2482 ext #14. We recommend booking all REC activities at least 30 days in advance to ensure availability and assist with scheduling of staff. Have you ever seen a high ropes course designed especially for kids? Most likely the answer is no, but we have built one here at Ponderosa. Specifically designed for 3rd graders through 6th graders our kids high ropes course is situated right below our adult high ropes course in a double-decker fashion. Suspended at a kid-friendly 20 feet high, our Kid’s High Ropes Course offers a choose-your-own challenge layout. The kids can choose to do up to 7 high traversing elements depending on their own unique comfort level. After completing as few or as many elements as they choose, they will exit the course by “Walking the Plank” which is a fun way to be lowered down to the ground. An ACCT certified safety and fall protection system will keep them safe during the entire challenge, while our trained staff will encourage them to push their personal limits. Logistics of the course: This course requires a minimum reaching height and we have found that it is best suited physically and emotionally to students from 3rd grade to 6th grade. If your group is younger than 3rd grade, then you can check out the Climbing Tower and Zip Lines. As you plan for your group’s reservation, you can estimate the time needed to be an average of 10 participants per hour. 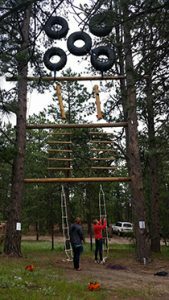 If your group size is large and you will not have enough time for this course, then please see our Climbing Tower and Zip Lines option since it is much faster for larger groups. A five minute safety briefing will be given at the start of your scheduled course time, so it is very important to have your whole group present and on time for your reservation. The course is available by reservation only on a first come, first served basis. Multiple staff must be scheduled to operate this course so reservations should be made at least 30 days in advance. 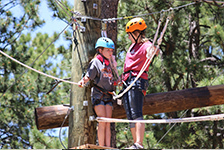 Call now to schedule your Kid’s High Ropes Course reservation at 719-481-2482 ext #14. We recommend booking all REC activities at least 30 days in advance to ensure availability and assist with scheduling of staff. Our climbing tower has been a high adventure staple for many years. Looming at the tops of the trees at 44 feet high, our tower will test your spirit. Featuring 2 rock climbing routes and a cargo net climb, the tower can accommodate the timid and the adventurous. Once you have ascended to the top, enjoy the picturesque view of Pike’s Peak while you are hooked up to the Zip Lines. Enjoy the fast drop of the Zip Lines on your way down from 44 feet to ground level. A rolling ladder system will help dismount you from the Zip Lines. *If rock climbing is your adventure, then our tower has 2 additional climbing routes on the back side. These more advanced routes feature overhang structures at the top and will test anyone’s strength. Due to safety regulations, these 2 routes cannot be operated at the same time as the Zip Lines. So if your group is into climbing, when making your reservation, just ask that all 4 rock climbs are opened without the Zip Lines. Climbers will be lowered back down using the belay ropes. The climbing tower is the best option if you have a large group because it has a much faster flow of participants. Additionally it is usually the best activity to choose if you have a wide age range in your group, such as for family groups. The Climbing tower and Zip Lines are a great activity for age 4 to adults. As you plan for your group’s reservation, you can estimate the time needed to be an average of 20 participants per hour. A five minute safety briefing will be given at the start of your scheduled course time, so it is very important to have your whole group present and on time for your reservation. The Climbing Tower and Zip Lines is available by reservation only on a first come, first served basis. Multiple staff must be scheduled to operate this activity so reservations should be made at least 30 days in advance. 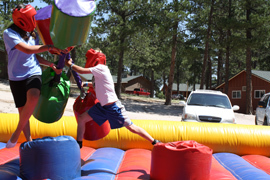 Call now to schedule your Climbing Tower and Zip Lines reservation at 719-481-2482 ext #14. We recommend booking all REC activities at least 30 days in advance to ensure availability and assist with scheduling of staff. For the most intense challenges we offer, reserve the Leap of Faith and the Vertical Playpen for your group. These 2 activities are not for the faint of heart and are guaranteed to accelerate your adrenaline levels. Offered together as a package, the Leap of Faith and the Vertical Playpen are a great alternative for that group that has been there and done that. The Vertical Playpen is physically the most challenging activity we offer. Looming at 40 feet high in the trees, the Playpen consists of an array of suspended materials from telephone poles to rope ladders and swinging logs to giant tractor tires. Inspired by the "Ninja Warrior" climbing events, this playpen will push anyone to their limits. Two climbers at a time attempt to scale the dangling obstacles which can inspire racing if you so choose. A dynamic belay system ensures fall protection during the entire climb and lowers the climbers back to the ground when finished. Do you have what it takes to make it to the top? The Leap of Faith is mentally the most demanding activity we offer. Also known as the “Power Pole” or even the “Pamper Pole,” it is a classic personal challenge. 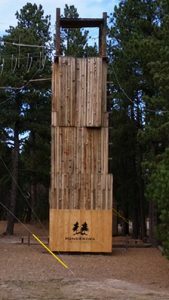 Using a full-body harness system, participants will climb a telephone pole 30 feet high using pole steps and staples- then it starts to get difficult. Once at the top the climber must stand on top of the pole which is about 12 inches in diameter and wobbly- then it starts to get even more difficult. The climbers must then leap off of the pole in an attempt to catch the suspended trapeze bar about 7 feet away. Hit or miss is not important, but taking the leap will test your mental fortitude and your faith. After leaping, climbers are lowered to the ground via their dynamic fall protection system. The Leap of Faith and Vertical Playpen are a great activity for students in 7th grade to adults. As you plan for your group’s reservation, you can estimate the time needed to be an average of 10 participants per hour on each activity. A five minute safety briefing will be given at the start of your scheduled time, so it is very important to have your whole group present and on time for your reservation. The Leap of Faith and Vertical Playpen are available by reservation only on a first come, first served basis. Multiple staff must be scheduled to operate these activities so reservations should be made at least 30 days in advance. Call now to schedule your Leap of Faith and Vertical Playpen reservation at 719-481-2482 ext #14. We recommend booking all REC activities at least 30 days in advance to ensure availability and assist with scheduling of staff. A great indoor option, we have the ability to do 2 towers at once in the gym. Two people work together on each tower to build as many full-size plastic milk crates as they can while also standing on top of them. They are harnessed in and belayed by a trained staff member at all times. Once the tower falls, they are tethered down to the floor. Looking for a fun indoor activity to add to your retreat? Inflatables are a great way to boost your activity schedule and expending some of that youthful energy. Unaffected by the weather or daylight, our inflatables can be set up inside the gym at the time you request and are a very affordable option for your group. Click below for descriptions and pricing information for the inflatables. The bounce house is a great activity for younger kids to burn some energy. The fully enclosed walls keep the kids from bouncing out, and a staff person will be present to keep things safe. Have the kids kick their shoes off and let them literally bounce off the walls! Price for the Bounce House is $75 per hour. Call now to schedule your Bounce House reservation at 719-481-2482 ext #14. We recommend booking all REC activities at least 30 days in advance to ensure availability and assist with scheduling of staff. Climb onto the pedestals, put on the padded helmet, and prepare to test your skills in pugil stick combat. Knock your opponent off of their pedestal American Gladiator style and you will be declared the winner. The fully inflated arena will be a soft place to land if you are defeated. Two people at a time battle it out as spectators cheer them on. The pugil sticks are fully padded for safety. A staff member will be present to serve as a referee and to ensure safe operations. Call now to schedule your Joust reservation at 719-481-2482 ext #14. We recommend booking all REC activities at least 30 days in advance to ensure availability and assist with scheduling of staff. 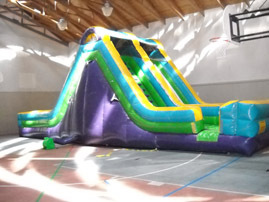 A fun activity for the younger crowd, the giant slide is so big that it fills up most of our gymnasium. At 20 feet high, the double sided slide produces fast speeds for sliding kids. The fully inflated design ensures a soft cushy landing area and stairway to climb to the top again. Since it is double sided, it provides a ton of sliding opportunity. A staff member will be present to ensure safety rules are followed. Price for the Giant Slide is $100 per hour. Call now to schedule your Giant Slide reservation at 719-481-2482 ext #14. We recommend booking all REC activities at least 30 days in advance to ensure availability and assist with scheduling of staff. Enjoy this classic camp activity that is fun for all ages. Hone your skills as you go for the bull’s eye, whether you are an experienced archer or a novice. At our archery range all equipment and instruction are provided as well as the supervision of a trained range staff. We have chosen to use the Genesis Compound Bows for our range to provide a quality experience that can accommodate all sizes of archers. Four shooting lanes will be open at one time as guests may cycle through them as many times as they want during the scheduled range time. To ensure everyone gets a good amount of shooting a group size of 20 or less is recommended for each hour-long session. 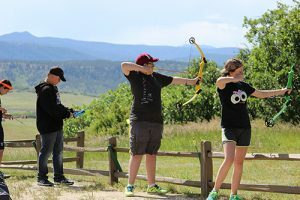 Due to insurance restrictions, no outside bows or equipment may be used at Ponderosa. 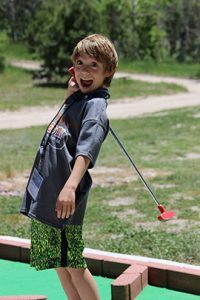 Call now to schedule your Archery reservation at 719-481-2482 ext #14. We recommend booking all REC activities at least 30 days in advance to ensure availability and assist with scheduling of staff. Come and play our 9 hole miniature golf course. Fun for all ages, the mini golf course includes children to adult-sized putters, a colored golf ball of your choice, and scorecard. Check out your equipment from the mini golf shack and putt away. Our mini golf course is open and staffed by appointment only. Cost for Miniature Golf is $2 per person. Call now to schedule your Miniature Golf reservation at 719-481-2482 ext #14. We recommend booking all REC activities at least 30 days in advance to ensure availability and assist with scheduling of staff. Enjoy a leisurely tour of the beautiful Ponderosa property with a group of friends. Putt along behind the little green tractor on the authentic hay wagon as you look at the scenery and wildlife. Hay rides are 1 hour long and can seat up to 20 guests. 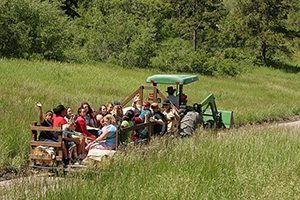 For larger groups, multiple hayrides can be scheduled back to back. Price for Hay rides is $75 per ride. Call now to schedule your Hay Ride reservation at 719-481-2482 ext #14. We recommend booking all REC activities at least 30 days in advance to ensure availability and assist with scheduling of staff. Looking for a late night activity? We have a new one for you and it’s called DODGEBALL… Black Light Dodgeball that is. Add a new twist to the classic game of dodgeball by playing it in a Black Light filled gymnasium. All the dodgeballs, cones and even the brightly colored clothes of the players will glow in the black lights. Spice it up even more by bringing some neon-colored face paint. All dodgeballs and cones are provided and the black lights will be installed for your reserved time. Due to popularity, Black Light Dodgeball can now be played anytime during the day as well as after dark. Additionally we have added a sound system playing high energy music to increase the intensity of this game. Price for Black Light Dodgeball is $75 per hour. Call now to schedule your Black Light Dodgeball reservation at 719-481-2482 ext #14. We recommend booking all REC activities at least 30 days in advance to ensure availability and assist with scheduling of staff.